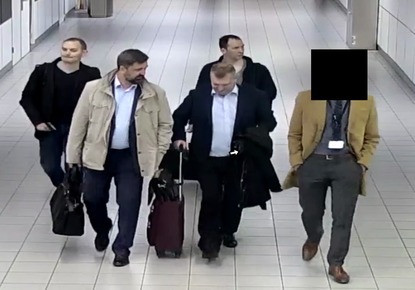 The men with a Russian embassy official at Schiphol. The Netherlands does not want to fall out with Russia over allegations of spy cyber activity, according to an expert in international law. Instead, the Dutch and British revealed in a press conference on Thursday, the alleged attempt was busted on 13th April and the four men were thrown out of the Netherlands. Knoops suggested that it was left to big brother America to pursue Russians accused of hacking, an action also announced on Thursday. ‘It is certainly not inconceivable that the expulsion is related to the subject matter’s sensitivity, particularly regarding the Dutch investigation into the MH17 disaster.’ Knoops told broadcaster NOS. He suggested that America is not affected by diplomatic tension around international evidence that a Russian missile filed by pro-Russian separatist fighters in Ukraine shot down the MH17 plane killing 298 people in July 2014. The Dutch intelligence services held a press conference on Thursday revealing details of what they claim was a Russian operation to infiltrate the OPCW, as it investigated the attempt to poison a former Russian spy in the UK this year. They claimed that on 13th April Dutch intelligence teams foiled an attempt by four Russian intelligence officers to hack into the OPCW in The Hague, from a rented car parked in a hotel car park nearby. They revealed the passports of the alleged spies, plus photographs and web searches from their computers and multiple telephones that were seized. The men, said Onno Eichelsheim, director of the MIVD Dutch military intelligence and security service, were clearly ‘not on holiday’ – an excuse given for two Russians accused of trying to murder Sergei Skripal. He said the Russians in the Netherlands had multiple telephones, took hotel room rubbish – including empty cans of Heineken and Aldi orange juice – with them and had $20,000 and €20,000 in cash. The four men, who arrived on diplomatic passports and were met by a Russian embassy employee, were ejected from the Netherlands. A spokesman for the defence ministry told DutchNews.nl that the alleged cyber spies were not arrested because ejection was considered a more effective option. ‘This was a contra intelligence operation, not a criminal investigation,’ he said. Moscow has denied involvement in the downing of the MH17 and on Thursday Russian foreign ministry spokeswoman Maria Zakharova dismissed the cyber spying allegations as ‘big fantasies’.